Twitch will label content created through a campaign arranged among the content creator, Twitch, and a third party, but it does not affect content in which Twitch does not participate. Twitch updated its policy today as an effort toward transparency to better inform an audience of which content is part of an "influencer campaign." Twitch will label content that has been sponsored, but only in the case of content that is a part of a Twitch-driven campaign. Influencer campaigns are a way for an advertiser to push their product through partnerships with broadcasters. Twitch offers an example: "An influencer campaign will feature a well-known broadcaster playing a newly released (or sometimes pre-released) title. When done right, this is a win-win for everyone involved: Brands get their games out there, influencers make some money doing what they do best, and viewers are entertained and informed by great content." However, without best practices pushing for disclosure, viewers may be confused as to which content is a part of a paid sponsorship. Twitch's terms of service states broadcasters must follow the Federal Trade Commission's Guidelines Concerning the Use of Testimonials and Endorsements. The FTC states endorsements should reflect the honest opinions of the endorser, and material connections between endorsers and advertisers must be disclosed. A material connection could be an advertiser paying the endorser for the content or providing the endorser a free product. "While we have always encouraged our broadcasters to acknowledge if they are playing games as part of a promotional campaign, we are now establishing a much more transparent approach to all paid programs on our platform and hope it sets a precedent for the broader industry," Matthew DiPietro, Twitch's vice president of marketing and communications, states. In newsletters and tweets, Twitch will label sponsored content. 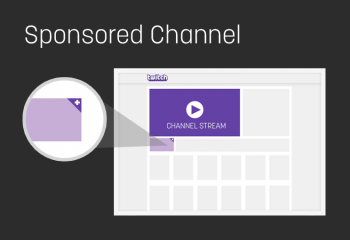 Twitch will also label sponsored channels. Again, Twitch will not denote content made through a partnership between a content creator and an advertisement if Twitch is not a participant of the promotion. Similarly, Valve stated curators who have accepted compensation for making a product recommendation must disclose that in the recommendation.